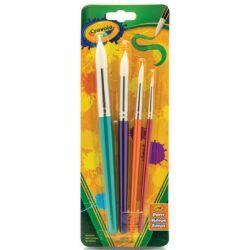 General purpose art & crafts brushes in fun colors. White synthetic bristle, colored metal ferrule, wood handle with cool metallic sheen. Wide widths for posters, signs, lettering, stenciling and more.